If anyone has pictures of Julian Stock’s Skull Truck that I could use, it would be much appreciated. When I lived Uptown in the late ’90s this was parked on Magazine St. all the time. I know that I took pictures of it, but darned if I can find them. 2. 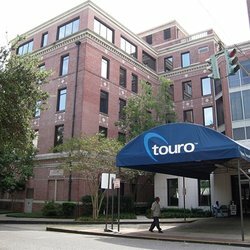 I never took pictures of the Touro building before the logo changed. The sign on the side of the building (that you could see from St. Charles) had letters that were back-lit in red light that read “Touro Infirmary”. It was creepy as Hell and I never thought to get a picture before the friendly new cool blue sign showed up.